Proposal automation software offers two big advantages to selling organisations. First, it ensures that consistent, accurate and effective proposals are produced that align with overall corporate marketing strategies, mission and values. Secondly, it liberates valuable knowledge workers and sales personnel from the time-consumptive task of assembling, formatting and producing the proposal documents. Well-executed proposals are critical to facilitating the sale of your product and communicating the value of your whole product to your prospects. When proposals are left to the last minute or prepared by people who often have other things they need to do, the resulting document is frequently less than desirable. Proposals are produced for the purpose of summarising the findings of the vendor/customer conversation over the course of the buying process. They also serve to accurately describe the nature of the product or service being offered and the cost associated with that offer. Additionally, many proposals will also contain some ROI or other cost-justification proofs to help the buyer understand why the price quoted is fair and reasonable. Finally, the proposal may contain some references or customer stories that are designed to lend credibility to the claims made by the seller. Beyond these tangible features, proposals are also used to communicate some higher-level messages to the buyer about the seller. The format of the document, the font selection and the use of graphics and visual branding tools all are built by Marketing to reflect an image that the company wishes to project. Other elements are reflective of this as well. Paper weight, colour and the use of binders, cover sheets and cover letters all are used towards this end. Building proposals in a one-off process du jour manner will not accomplish this. The proposal creator, a sales rep, an office admin or a product manager drafted into the process will create what they think is best. Sometimes this is good, sometimes not. 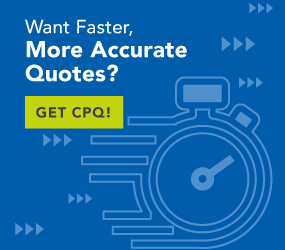 If they have access to quotation management software, they will get the product listing correct, and the pricing will be right; but what about the rest of the message? The sales rep may favour crème-coloured, heavy-stock paper with a jazzy font that they think is cool-looking. They may pull some customer stories that they are familiar with but have little to do with the prospect’s view of the world. A product manager may dump an inordinate amount of information into the document about the engineering or technical aspects of the product, which are of no interest to the buyer or recipient of the proposal. Proposal automation software will remove all of these incidental decision points from the creation process. The proposal will be produced in total alignment with the marketing requirements that are relevant to customer-facing written communication and present the company in the best light possible. Who has time to build a proposal? Proposal automation software keeps your employees doing their jobs? Sales reps are hired to sell. Admins are hired to take care of executive functions or departmental functions. Product managers and engineers are directed to oversee the development and improvement of products. Marketing folks are overseeing the assorted communication of product and corporate value and mission information to the buying community. None of these people really have time to drop everything and work on proposals. When the call comes in on Friday afternoon for a proposal to be delivered on Monday morning, it should not result in a panic-driven fire drill or long hours over the weekend. People should not be drafted out of their “real” jobs to fulfil a request for a proposal. Proposal automation software uses information pulled from CRM for your customer elements. Product and pricing data is available directly from your marketing and other relevant back-office systems. A standard paragraph language should be user invoked to populate the proposal with the language required to meet the customer’s needs regarding the acquisition. Visual aspects of the proposal are built into the process ensuring that the proposal meets the standard set forth for external customer-facing documents. The time required to customise the document to fit the specific needs for an offering to a prospect should be minimal. The proposal process should minimise the need for “last minute” proposals as well. Last-minute proposal requests are frequently not proposal requests at all. They are column-fodder requests. While you may have no choice about replying, you should not have to spend evenings and weekends building documents that ultimately won’t be read. The sales cycle should provide adequate opportunity to select applicable product, run trial pricing, look for relevant customer testimonials and stories and assemble virtually all of the information required to build the proposal needs to close your deal. The final step in the process should essentially be nothing more than pushing a print button and making copies for your presentation.